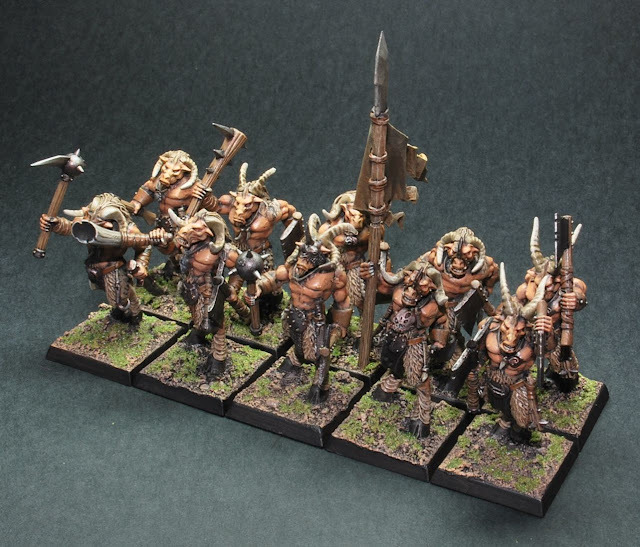 MiniKingdom: BEASTMEN - Arrgh, I got paint all over my dudes! Here is some evidence of the busy week. So the paint scheme is pretty generic earth tones, but it works and I let the character of the models speak for itself rather than flash colours in this case. The ethos behind this army is rather no-nonsense, zero faff. Faff free you might say. There has been quite a few conversion adjustments to all these models. These are perhaps too subtle to see at a glance, but hopefully the overall appearance of the units works out. Firstly I removed many of the usual extraneous skulls and heads. One body piece has a large skull hanging in the middle of their chest, another has one propped on their kneecap. I found both of these overbearing, if not offensive, and they were quickly removed. Rudimentary muscle tone was filed into the exposed chests and a lot of the removed pendant pieces were replaced with rune stones. The next to be removed was all hair/mane braiding. This was, in part, while I was adjusting most of the horns. But mainly I just couldn't picture these guys sitting around camp fires in the evening braiding each others hair and grunting about the weather and how their day went. Not so much a macho statement, more a sense of simple survival traits and behaviour. Either way the braids got my goat and had to go. 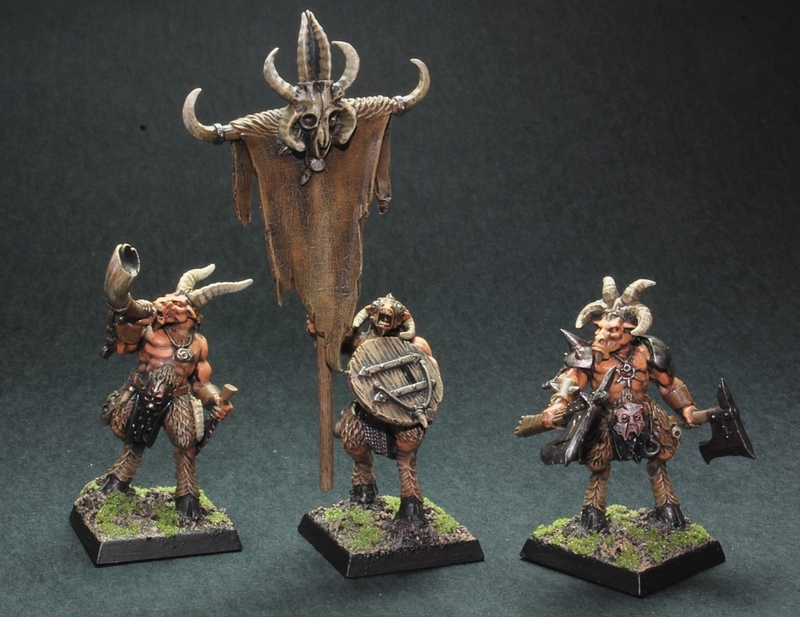 Talking of the horns, I felt the angle on these was lacking. 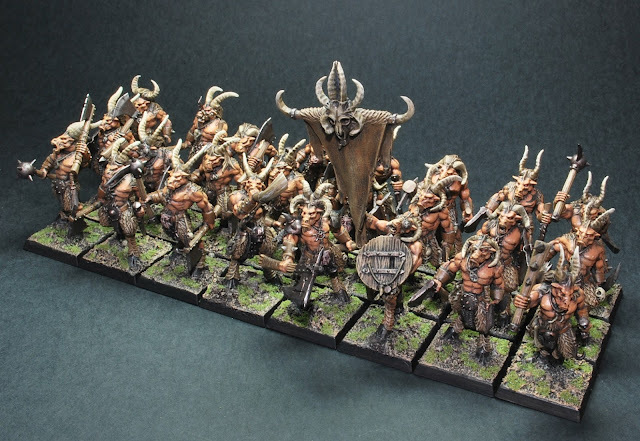 The models with more upright horns looking a little more imposing. So I tilted many of them up adding in plenty of extra fur/manes. These manes are a little shabby sculpt wise but no doubt such practice will improve my execution. Tufts of fur were also added around the shoulder line and some sculpting so virtually no gaps or lines are visible. Then at last the models were actually ready. Tattered cloths only painted flat black for the moment, a nice contrast but may receive some extra tone. No designs for the standards yet, still deliberating on that. Extra Gor, used as an ambush element or to reinforce the main unit. 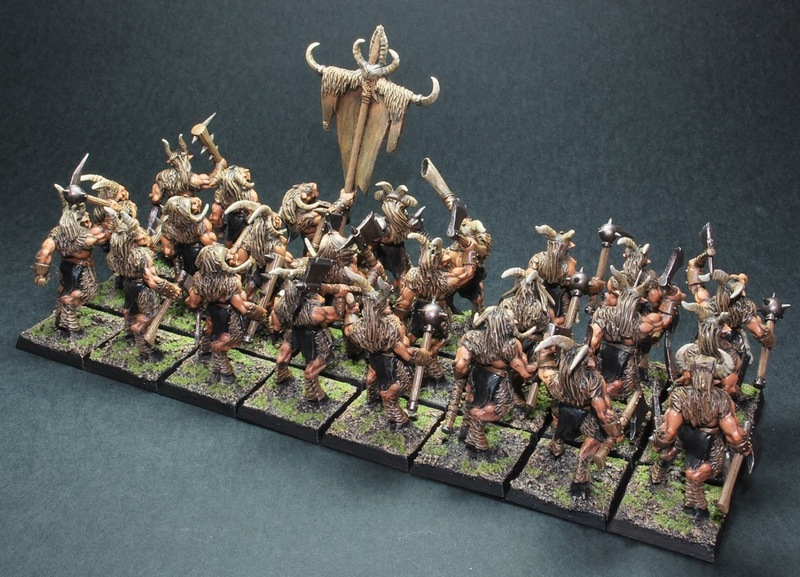 hi i know this is an old post but any chance you could tell me what paint scheme was for the skin and fur?